If you’re looking for something hearty, tasty, and ridiculously easy, you should try this pasta recipe. Season chicken generously with salt and pepper and any herbs you like, such as dried basil or parsley. Either cook the chicken in a frying pan or bake in the oven at 350 for 35-45 minutes. Make sure it isn’t pink inside! Once the chicken is halfway cooked, fill a pot with water and add 1 tsp. salt and bring it to boil. Remove stems and finely chop your parsley and thinly slice the garlic and set aside. In a large frying pan add a generous amount of olive oil, ¼-1/2 of a cup. Heat the oil on medium heat until the oil shines; add your garlic and chili flakes and stir continuously to brown lightly. Turn down the heat once the garlic has a nice colour and drain the pasta if it is cooked to the desired softness. Keep some of the pasta water, about 1/4 of a cup, to add to pasta. Add the pasta to the oil and garlic and chili flakes, and fold evenly towards the inside of the pan to coat all the pasta. Add in the parsley and repeat this process. Add 1/4 cup of the pasta water, squeeze the lemon over the pasta, and toss once more. To serve, plate the pasta and slice the chicken. 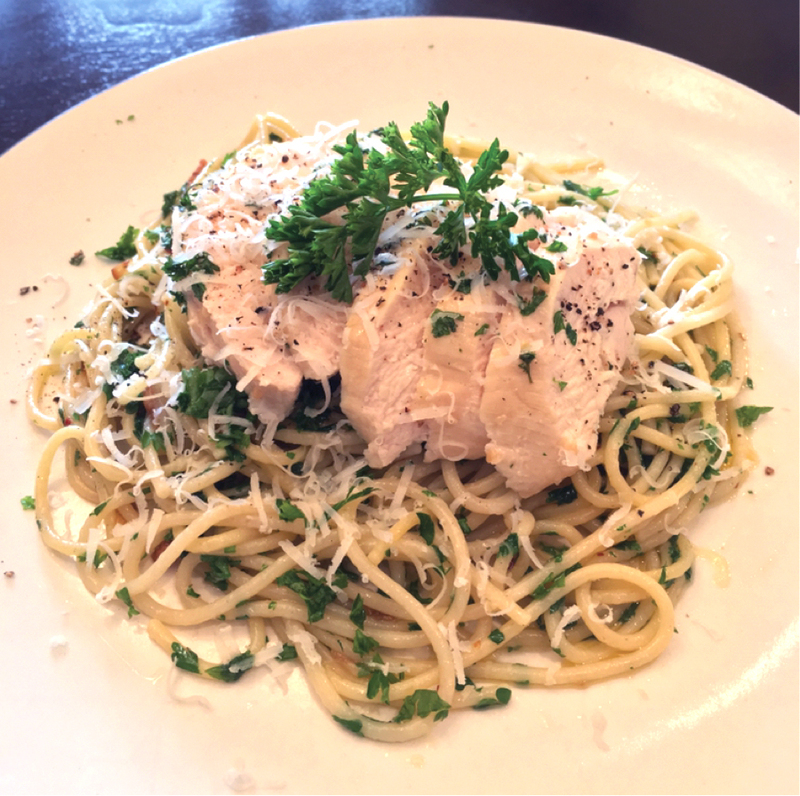 Place the chicken on top of the pasta and garnish with shredded Parmesan cheese.